The Leprosy of Spiritual Immaturity. The Thirty-Second Wednesday of Ordinary Time. 2:19 PM 11/12/2014 — Of course the Gospel today focuses on the virtue of gratitude. We’d probably all agree that gratitude is a rare enough quality when it comes to how we deal with one another; but, it’s just as rare, if not more so, in our dealings with God. 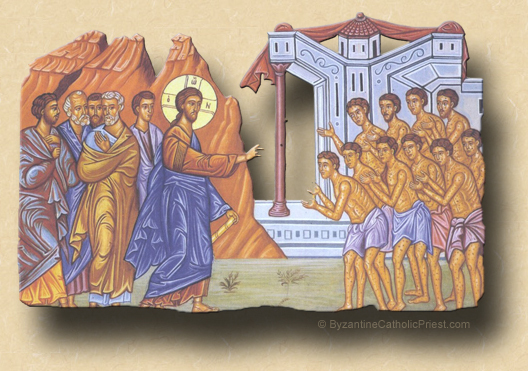 And today we are presented that incident when our Lord encountered ten lepers and cured them all, but only one came back to give thanks. And our Lord even asked him, “Were not all ten made clean? And the other nine, where are they?” And I don’t wonder if that ratio isn’t accurate. We are grateful for maybe a tenth of what we should be grateful for. In a couple of weeks our nation will observe that annual day of prayer—at least originally it was supposed to be a day of prayer—which we call Thanksgiving Day, and right after that begins the penitential season of Advent; so, here’s a question you can add to your examination of conscience for both occasions: am I grateful for everything I have received, or do I choose, instead, to brood about what I think has been denied to me?